While movies are a visual medium not all directors get that visuals can do more than simply depict the story they can enhance it and even tell a story of their own. Baz Luhrmann understands the power of the visual. His films are bombastic, fast, flashy, and even though his stories can be…thin, his visuals- and speed of light editing- never are. Which is not to say that those same visuals can’t sometimes go a smidge too far. The story of The Great Gatsby is about love, longing, and really nauseatingly rich people being generally bored. There are subplots, sure, but for the most part these are the broad strokes we’re looking at. It’s a surprisingly sparse story considering how enduring it is. But, what sets this apart from other similar stories is the setting of the decadent “Roaring 20s” which Luhrmann depicts with giddy delight filling our screens with dazzle, over the top crazy, and Luhrmann’s trademark anachronistic weirdness. As with Luhrmann’s previous work, particularly Moulin Rouge!, music choices seem to just be his spotify playlists with a horn section. The music in this film runs the gamut from standards done by modern artists to modern songs that get jazzified. In some ways it works but mostly it’s surprise for the sake of it. Leonardo DiCaprio basically plays an amalgam of every character he’s ever played as the ultra rich Jay Gatsby. He’s charming, suave, and oozes a desperate intensity that vibrates off the screen. His scenes with Tobey Maguire’s Nick Carraway, which he spends about 80% of the film with, are just great. DiCaprio raises the game of the actors he shares the screen with. As a matter of fact, prior to DiCaprio’s entrance into the film, about a third in, there is a serious lack of momentum. 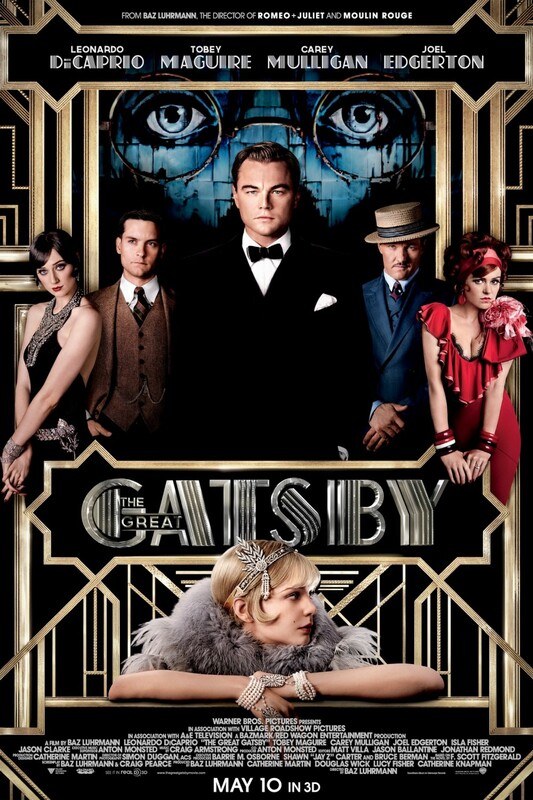 Which is not to say that Joel Edgerton, Carey Mulligan, and Elizabeth Debicki are bad in their roles as, basically, the only other people in all of New York it’s just that as the whole movie feels like more of a stage play rather than a movie and their energy is completely flat without the foil of Gatsby. There’s not much in this film that doesn’t work, except the weird framing device employed. You see, in the book-which I’ll review in a separate post soon- the Carraway character acts as a first person narrator so too in the film does Maguire’s character. However, instead of simply making him a narrator there is a forced device of Carraway “writing” his story as he recovers from…essentially the events in this film. The whole exercise is simply so lame that it is a total failure. It kills all momentum in the film when it pops up, it muddles the opening of the film and it makes Carraway’s entire character arc sadder than it has any right to be. Like the book, this is Gatsby’s story through and through. Even though we experience it from Carraway’s perspective, he’s less a player in the story as an observer of it. By injecting this device where it never existed we’re given an unneeded insight into a character that is purposely underwritten.